The fabric printer I am want to use will only accept TIF, JPG, PNG, or GIF files for printing. How can I save a PDF 1:1 marker file in this format without losing the 1:1 size ratio? In Easy marking if you use save as 1:1, do you not have the .pdf option? What version of AccuMark are you using? And what software do you use to view/print pdf? 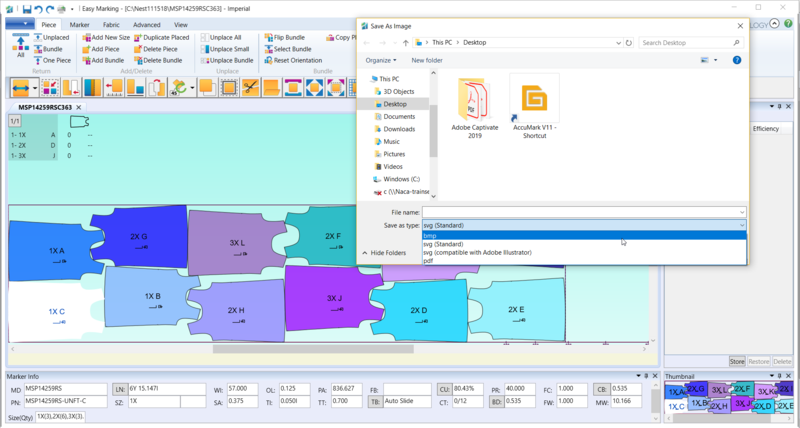 In Easy Marking the File --> Save As 1:1 option has a BMP (bitmap) file type. This will keep the size ratio when saving marker images in full size. Saving as a PDF has a width limit so it will resize the marker image file to fit, which is not what you want. 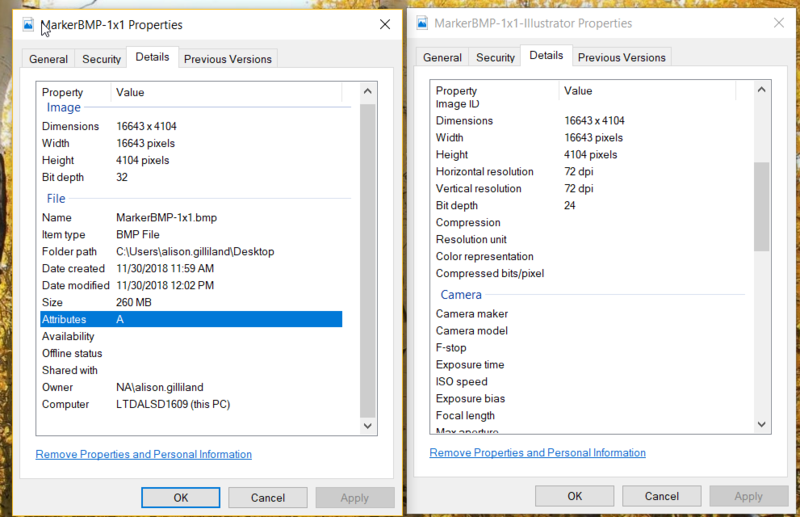 I would check to see if your printer will accept a BMP file over a JPG since bitmap files are somewhat uncompressed versions of a standard jpeg. However, if you do have Illustrator you can convert the file from BMP to JPEG. 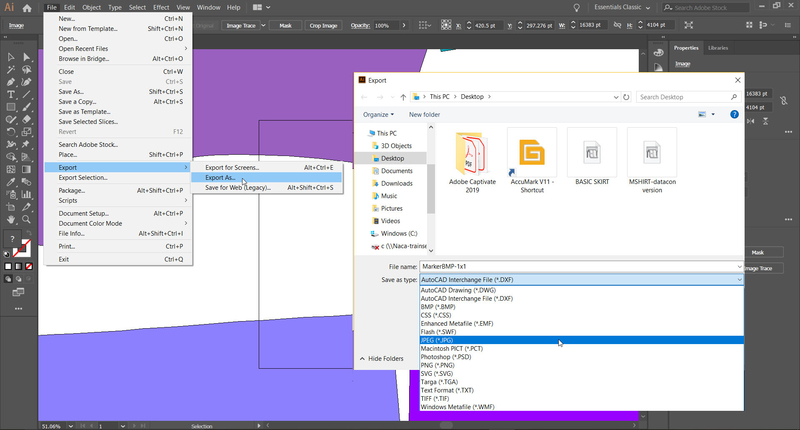 Open the bitmap file into Illustrator then choose File --> Export --> Export As. Here you can choose JPEG as a file type. There are free online converters if you search for 'bmp to jpg' or even 'pdf to jpg'. If you do use this method double check the image properties to make certain that the dimensions are the same as the original Easy Marking Save As 1:1 file. I found most free converters don't like how large the 1:1 files can be and will not change them. These screenshots were taken from AccuMark v11 and Adobe Illustrator CC 2019. PDF to JPEG file conversions are available in Acrobat DC but as mentioned there are free online converters as well. The printer is a company, not a physical fabric printer I have. The file type is their requirement. I was able to convert the PDF files to JPEG format in Photoshop. I just had to acquire that software. Thank you for the info regarding Illustrator. also yuo can use Gerber's utility ConvertHPGL.exe.